Russian Caravan tea is not named that just for the fun of it. As the story goes, this tea, usually a blend of oolong, Keemun, and Lapsang Souchong teas, was transported from the tea growing and producing regions of China (mostly in the southern and eastern provinces), India, and Sri Lanka (called Ceylon at that time) to Russia by camel caravan. The teas supposedly took on a smoky quality from the campfires where they stopped for the night. If you find yourself serving this tea, you’re “going Russian” at tea time. The centerpiece of a Russian tea time is the samovar – shown in the image below with the white teapot set on top of it. The teapot holds extra strong tea. The samovar holds hot water. You pour a little tea in the tea glass (in its silver/metal holder) and add in water from the spigot on the samovar. 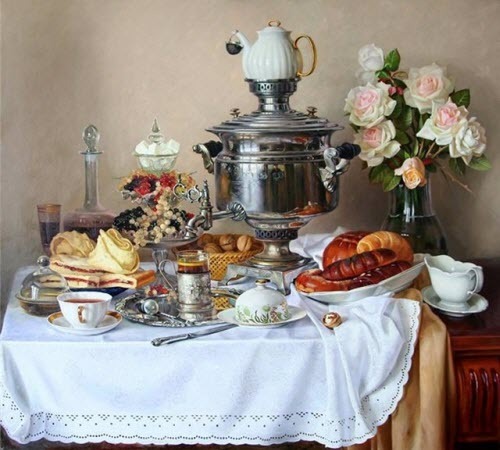 The samovar and plenty of savories piled on the table are great signs that you’ve “gone Russian” at tea time. 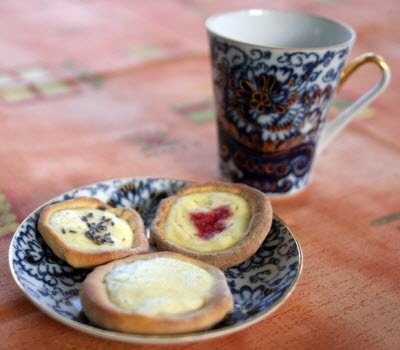 A Russian open-faced pie or tart pastry called vatrushka takes front and center on your tea table. It’s made from yeast dough and filled sweetened fresh cheese, similar to a cheese Danish. Or you can fill with jam, fruit preserves, mashed vegetables, or ground meat, as shown in this recipe. Other traditional Russian dishes are also good to have at tea time: soups such as such as tyurya, okroshka, botvinya, shchi (cabbage), rassolnik, and solyanka; meat dishes such as zharkoye, offal dishes, andPelmeni; blinis (thin pancakes made with yeasted batter); pirozhki (small buns/pies stuffed meats and/or vegetables); and more. A certain fairly well-known Russian personage has been photographed more than once with his shirt off and doing things like wrestling bears, hunting, fishing, horseback riding, etc. If you guys out there find yourself doing this to entertain your tea time guests, it’s a sure sign you have gone “russkiye.” As for us of the feminine gender, the sky seems to be the limit. 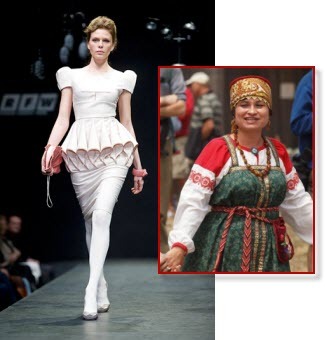 Russian fashion ranges from the folksy traditional to ultra-modern. Are you there yet? Have you “gone Russian”? If so, have a great time. And if not, get a move on and make that transformation complete! Fun article! I’m getting ready for a Russian tea this evening. By the way, it’s pronounced, “Chai”, and there is always, always a bar of chocolate to share among friends.